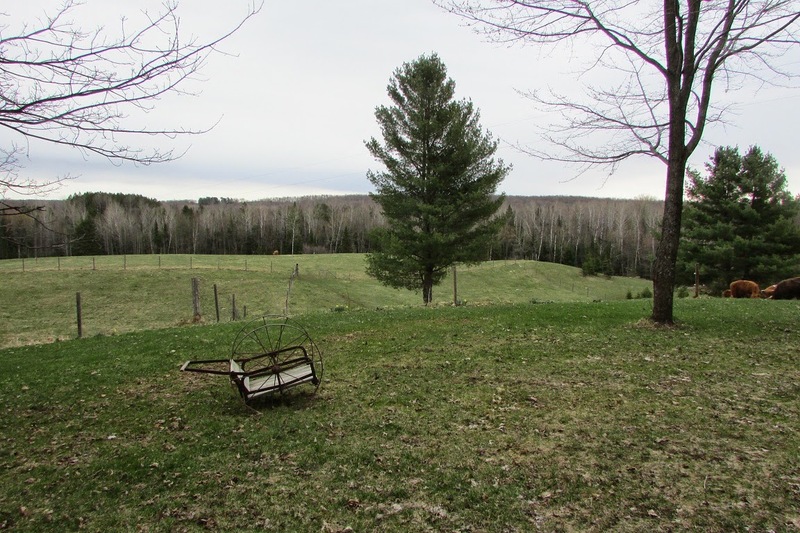 This morning, before the sun had risen above the trees, I woke up to the sound of a cow bellowing. She was in the paddock across the little valley to the east, in front of our house. Our bedroom is upstairs and faces the valley, but I could see nothing from the balcony outside our bedroom. looked out on the field earlier. Can you see Maisie? From that balcony, there are many tree branches that block my vision, so I went downstairs and stepped outside to where I could get a clear view. I did not like what I saw. Our heifer cow, Maisie, was standing on a rise in the paddock. It was she that was bellowing. I had been expecting her to be having a calf this week, and I suspected her vocalizing had something to do with this. It would be her first. But when I saw the reason for her bellows, I became frightened for her. 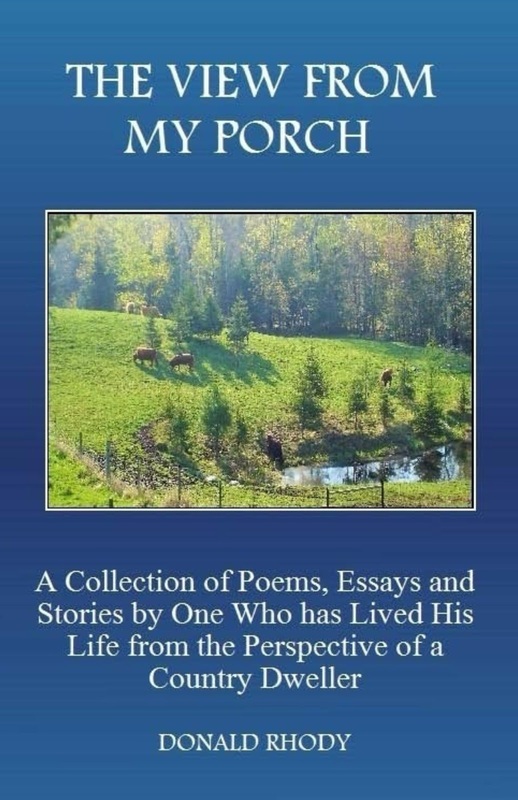 There were two wolves also with her in the pasture, running back and forth and circling her. Seeing this, I myself bellowed. Not the same as Maisie, but I yelled as loud as I could. But the wolves were far away and I knew that they would need a louder sound than my own voice to frighten them. I ran back to the house to get a rifle. I don’t know what the present law is for shooting wolves. It goes back and forth. But I was not really shooting for the kill. At that distance, and with the wolves running, I knew that I could never hit them anyway. So I just shot in their vicinity, but not to hit anything. The sound of the shot was enough, even though it was a small caliber rifle. The wolves ran into the woods. 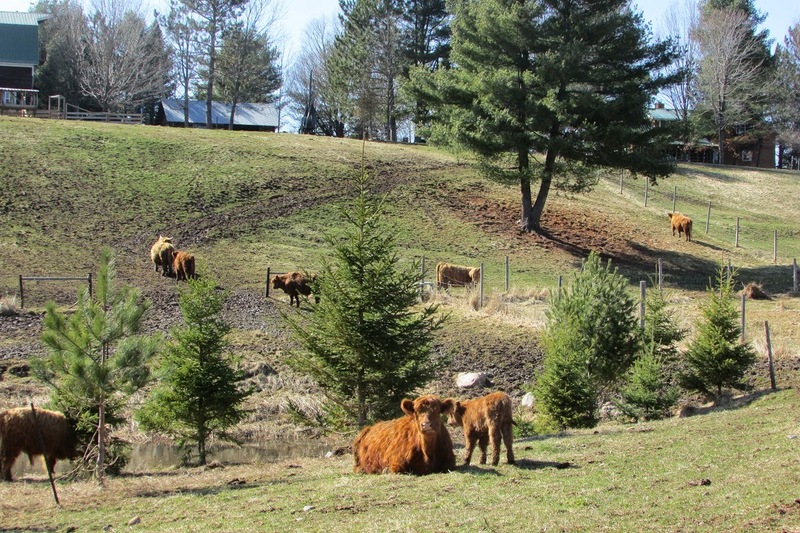 Most of the other cows were up by the barn, but McTavish, our bull, was not. Although I had not noticed him at first, he was down by Maisie and facing off the wolves. As I stood there, the other cows now started down the valley to go out to where Maisie was. I expected that there would also be a calf lying there, but I wondered if it would be alive. I was in my pajamas and bare feet, so I ran back in the house and put on my jeans and boots. With the rifle still in my hand, I followed the rest of the herd up the other side of the valley. Maisie seemed to have settled down. looking at and sniffing a little red calf that was lying in the short grass. There was also blood around the spot in the field. 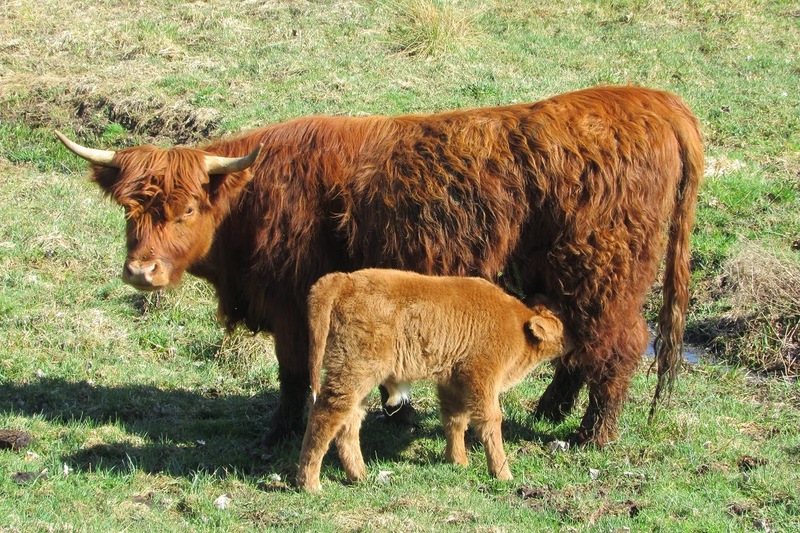 At first fearful at what I might find, as I approached the newborn, I could see that the calf was fine. It was alive and seemed healthy, still wet from the birth. The blood on the ground was that of the birthing process. I stooped down to rub it a little and to check it over. A little bull calf. McTavish seems to be following the Rhody tradition. He has mostly boys. Maisie was also fine. A couple hours later, she had her first calf nursing from her. She will be a good mother. I will have all the cows and calves up by the barn tonight. Yesterday, our young cow Flory was standing down in the valley next to the pond. She was bellowing repeatedly with her cow-like bellow. It seemed that she had lost her calf. She had this calf only two days before. It was her first one. On that day, I also heard her bellowing, but at that time she was farther in the valley and into the woods. I went to check on her, since it is not common for cows to stand and bellow for no reason. 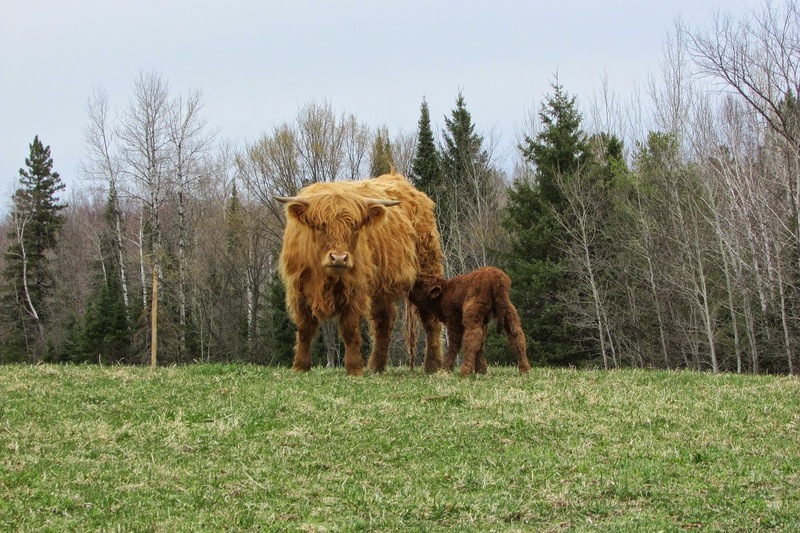 When I got to her, she was standing in the middle of some small maples with newborn calf. The calf must have been born some hours earlier, since it was already dried and lying like a little furry ball in last autumn’s leaves. Flory was standing over her, looking quite pleased with herself. The bellowing had stopped and her only words now were softer moos. I left the two of them. Flory seemed to be doing well with her new role as a mother, so I thought that I should let nature dictate how she should care for the calf. I went back up to the barn, where I had my own concerns that I was working on. I do have a fear about my calves this year, however. 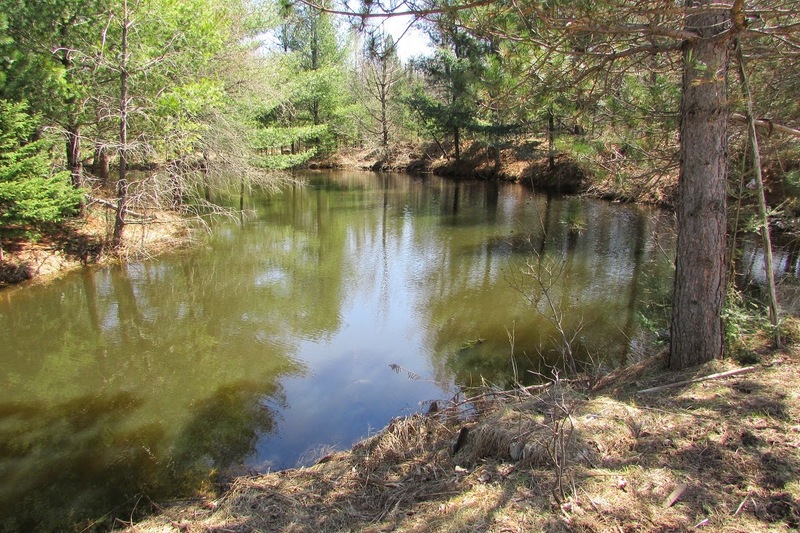 The pond in the valley has very steep banks, banks down which a newborn little calf could easily roll. Just a couple weeks ago, another of my cows, Effie, had her calf right on the top of the bank. I was also home when that one was born, so I went down and moved the newborn far away from the water. However, an hour later when I went to check on the little one, he was again right next to the pond, this time on a narrow trail that is right on the water’s edge. Again I moved him. I ended up moving him three times before Effie was satisfied that where I put her little calf was better than where she put him. But now, Flory was standing next to that same pond with a fearful (it seemed to me) tone to her bellow. I went to the pond, walked all around it and peered into the water, still icy cold in this early spring. I saw nothing, but I wondered if a calf, having fallen into the pond, would sink out of sight. Hoping that this was not the case, I next set off to the place where I had earlier in the day saw Flory emerge from the woods. Flory followed me. emerge from a forehead of long hair that hangs over his eyes. He has a very fearsome look, but he is really not aggressive at all. 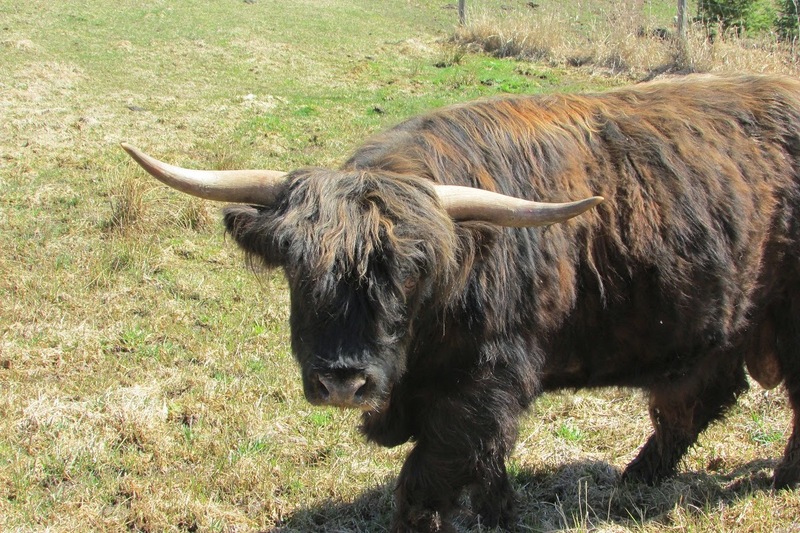 He is, as are all my cows, Scottish Highland cattle, which are quite docile by nature. 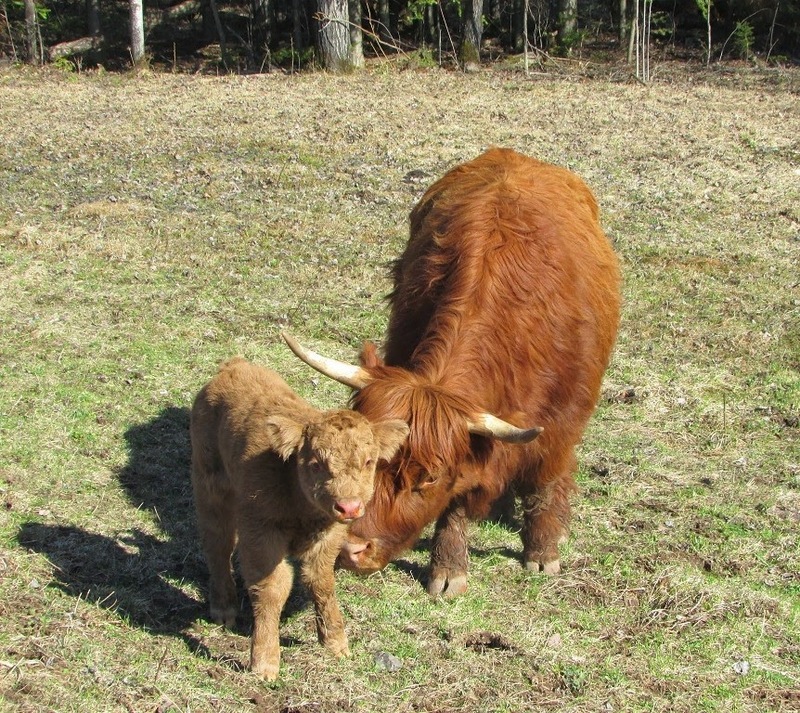 McTavish is also the father of this new born calf. 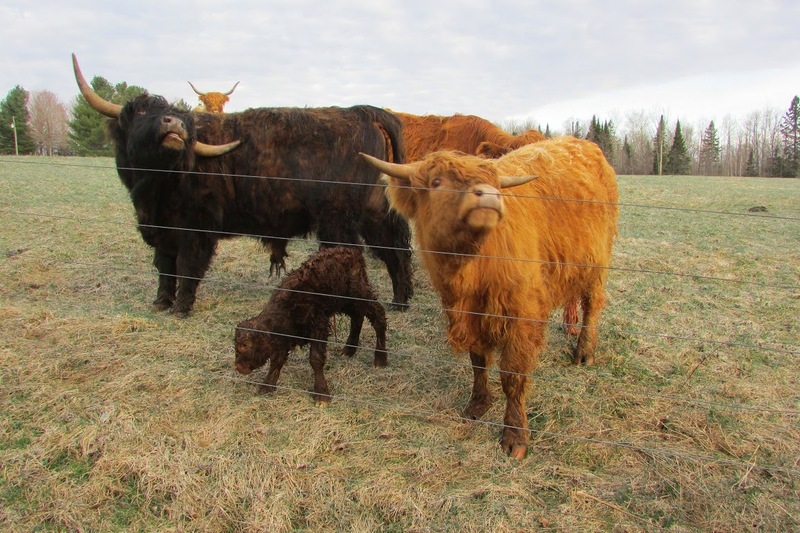 In the cattle industry, they do not say “father,” but rather that the calf was “sired” by McTavish. But because of this interest that he showed in the lost calf, I think that perhaps father might be a better term in this case. Not only did McTavish begin to follow me into the woods, but also Flory’s own mother, the grandmother of the newborn. This cow, as it happened to be, was the same Effie with whom I earlier had a discussion about leaving her calf so close to water’s edge. Effie also was the mother of Flory, who had given birth to her two years earlier near the same spot where Flory had her first calf. Flory had also been Effie’s firstborn. follow, but it was not that they were not interested. They stood at the crest of the hill watching us disappear into the woods. Effie’s calf was also up on the hill watching with the rest of the herd. I suppose Effie had left them in charge. I did not have any idea where in the woods I should search for the calf, but the ground is still muddy in this early spring, and I looked for fresh hoof prints. I don’t know if I saw the right prints, but it turns out that I was successful in approaching the general area where Flory had left her calf, because when I was about fifty yards away from where the calf lie, Effie seemed to remember the place. She ran ahead of me, followed by McTavish, and then by Effie. full udder. I stayed for a couple of minutes, then headed back up the hill to the barn. I was followed by McTavish and then by Effie. Flory’s bellowing had stopped. She now just gave contented moos as she stayed in the woods nursing her firstborn. You have heard it said that to raise a child it takes a village? 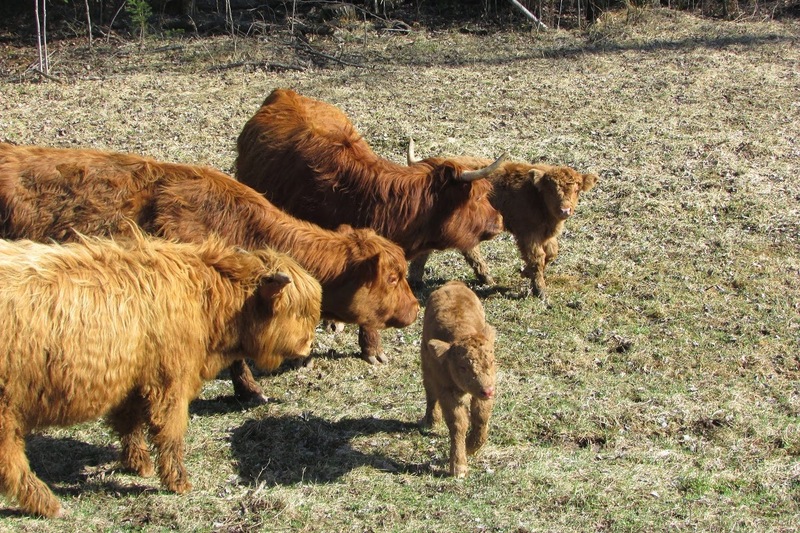 Well, to raise a calf it takes a herd. 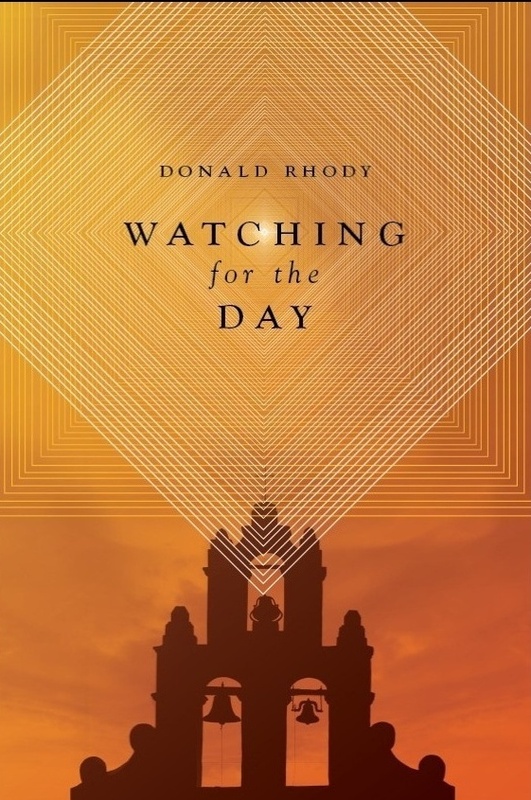 It is difficult for us to know the depths of what the followers of Jesus were thinking in the hours and the days immediately following his crucifixion. Their leader was dead. He had not only been their leader, but he was their teacher and the one in whom they had invested their entire lives. When the disciples began to follow Christ, they had not been thinking in terms of some revolutionary movement. If that would have been the case, the death of the leader would mean only that they would have to choose another to take the reins of leadership. But Jesus was not merely a leader of a movement. He was their Master, their Messiah, their Savior. Jesus was God! And now he was dead! Of course, as we look now back on those days and with the advantage of knowing how Jesus would be resurrected back to life, we can easily criticize the disciples for their lack of faith. After all, had not Jesus told them that he was going to be crucified? Had they not understood the teachings of Jesus and the prophecies that told that the Messiah would be raised from the dead? These things were true, but it is difficult for us to imagine what the followers of Jesus were going through at that time. If the Romans had killed Jesus, certainly the disciples were also in danger; especially since the high priest and all of the Jewish leadership were on somewhat of a vendetta to exterminate all of the disciples and even all memory of Jesus. The disciples feared for their own lives. They went into hiding. They did not know what to do. occurred was a group of women. Among this group were Mary Magdalene, Mary the mother of James, Joanna and Salome; but there were others in the group as well. (Mark 16:1; Luke 24:10). Very early on the morning that Jesus had risen from the dead, this group of ladies made their way through the semi-light of the dawn to go to the tomb. They had not planned on going to see a risen Christ; rather, they were going to mourn. They brought with them some aromatic spices to anoint the body of Jesus. This was a custom of the day to reduce the smell of a decomposing corpse, and the women were planning on doing this as a sign of devotion to Jesus. They knew him to be dead. But they had not completely thought out their plan. On the way to the tomb, it occurred to them that the sepulcher had been sealed shut by a large stone. They were saying to one another, “Who will roll away the stone for us from the entrance of the tomb?” (Mark 16:3). As it turned out, they needn’t have worried. When they arrived at the tomb, they saw that the stone had already been removed from the entrance. 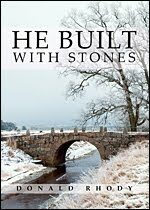 What had happened was that sometime during the very early hours, an angel with the appearance of lightning and dressed in a bright white garment had come to roll the stone away (Matthew 28:2-3). The women had not seen this angel, so they were surprised that the stone had been removed and even more surprised when they entered the tomb and could not see the body of Jesus (Luke 24:4). As they stood there, wondering what to do next, two men suddenly appeared – two men dressed in “dazzling apparel.” One of them said to the women, “Do not be afraid; for I know that you are looking for Jesus who has been crucified. He is not here, for He has risen, just as He said. Come, see the place where He was lying. Go quickly and tell His disciples that He has risen from the dead; and behold, He is going before you into Galilee, there you will see Him; behold, I have told you” (Matthew 28:5-7). This is what the women decided to do. They began to run back to tell the disciples, feeling both joy at the news, but also fear, because this was something that they could not comprehend. They had a difficult time grasping what had occurred. It was all too much for them to take in at once. As they were running back, Jesus met them and greeted them, and he said, “Do not be afraid; go and take word to My brethren to leave for Galilee, and there they shall see Me” (Matthew 28:10). Matthew tells us that at this time, the women even came to Jesus, took hold of his feet and worshiped him. However, it seems that they still were not convinced that Jesus had actually risen from the dead. It all just seemed too incredible. By the time that they came to the disciples, they may have even been unsure if what they had seen was real, or if it had been a vision (Luke 24:23-24). 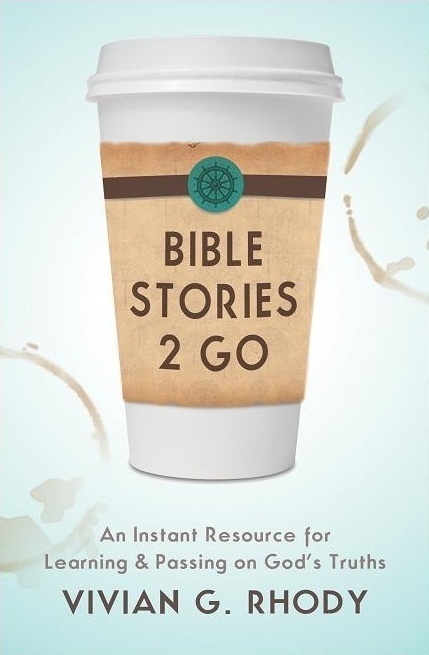 Certainly, when the women told their story to the disciples, they must not have sounded very convincing. In fact, to the disciples, their words sounded like nonsense (Luke 24:7). Perhaps some emotional wishful thinking by some distraught women. But if the disciples thought that the women were having a difficult time dealing with this turn of events, they were having their own difficulties. It was not they who had ventured to the tomb. Out of fear of the Jews, the disciples preferred to stay out of sight, behind closed doors (John 20:19). It is unclear if Peter and John were with the other disciples at this point. Mary Magdalene came to deliver the news to them (John 20:2). When Mary told them that the body of Jesus was missing, the two disciples decided to go to investigate this. This was somewhat of an act of courage on their part, since they knew that they were wanted by the authorities. Peter earlier, out of fear, had actually denied three times that he even knew Jesus. But now, with the report of Mary Magdalene, the two men literally ran to the tomb. John arrived first, but he hesitated at the door. He peered in from the outside and saw the grave clothes lying inside the tomb, but did not go in. When Peter caught up, no doubt out of breath, he entered the tomb immediately, seeing the linens and the head cloth, rolled up and lying apart from the other grave clothes (John 20:3-10). These two men were beginning to realize what had happened. They still may not of understood completely what Jesus had told him about the fulfillment of the prophecies concerning his resurrection (John 20:9), but some light was beginning to dawn in their minds. With new-found courage in a Lord who seemed to have risen from the dead, Peter and John returned not to where most of the disciples were huddled in fear, but instead to their own homes (John 20:10). They were beginning to believe. 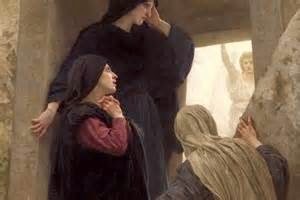 (John 20: 11-17) Mary Magdalene had returned to the tomb with Peter and John, but she apparently arrived a bit later, since the two disciples had run there. Mary was not there when the two entered the tomb. However, she arrived at the place and stayed even after the two disciples had left, still not knowing what to make of all that had happened. She first remained outside, weeping over a Jesus that she still assumed dead. Calling up some courage, she stooped down to look into the tomb. What she saw instead of the body of Jesus were two angels sitting, one at the head, and one at the foot of where the body of Jesus had been lying. “Woman, why are you weeping?” They asked her. “Because they have taken away my Lord, and I do not know where they have laid Him,” she answered. She turned then and said to Him in Hebrew, “Rabboni!” (Which means, Teacher). Mary had come to completely and unreservedly believe that Jesus was alive. She had seen Jesus. That same day, there were two disciples who were walking on the way to the town of Emmaus, which was about seven miles from Jerusalem. As they walked, they were discussing all of the events that had taken place and wondering what to make of all of it. They were simply confused. As they walked, Jesus approached them and began walking with them, but they did not recognize him. As they continued to discuss the matters, Jesus asked them what they were talking about. “Are you the only one in Jerusalem who does not know what has happened?” they asked incredulously. They began to explain to him about the crucifixion of Jesus, but also of the recent reports of him being seen alive. Jesus then began to explain to them the Old Testament prophecies that had been written about this very event. 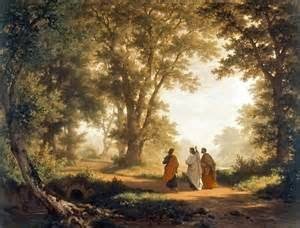 When they reached Emmaus, Jesus acted like he intended to continue further on the road, but the two men convinced him to stay, since it was getting to be evening. Jesus consented. 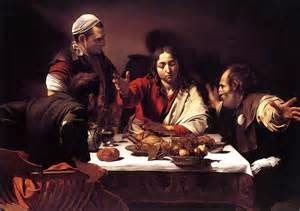 At the meal time, he took the bread, blessed it and began to hand it to the two disciples. 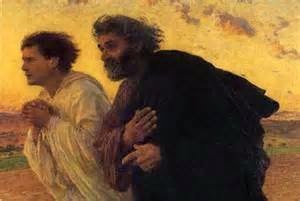 So excited were they, that instead of staying in Emmaus as they had planned, they returned to Jerusalem that very hour. They went to where the disciples and followers of Jesus were gathered and told them what had happened. They had seen Jesus! At some point during the day, Peter had also reported seeing Jesus (Luke 24:53, 1 Corinthians 15:5). The two men on the Emmaus road knew now that this was true, because they had also seen him. They now believed that Jesus was alive! As they were speaking, Jesus appeared and stood in their midst. His presence startled those in the room. Even with all that the disciples had heard, they still did not understand. They were startled and frightened and thought that they were seeing a spirit. 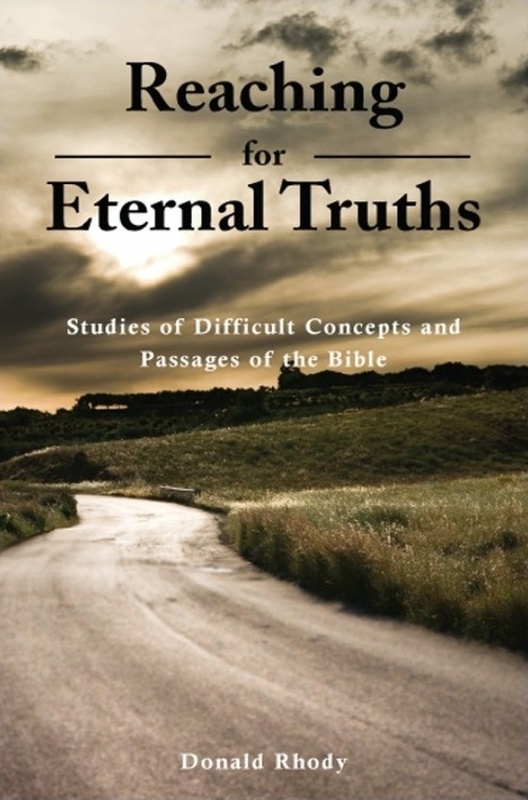 But Jesus said to them, “Why are you troubled, and why do doubts arise in your hearts? See My hands and My feet, that it is I Myself; touch Me and see, for a spirit does not have flesh and bones as you see that I have” (Luke 24:13-39). They needed peace. They had been huddled in fear, trying to figure out what to do next. 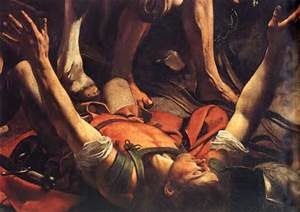 Jesus showed them the wounds of the nails in his hands and from the spear that had been thrust into his side. They believed. They had seen Jesus. One of the disciples was not there at that moment. This was Thomas. When he did come, Jesus had already left, but the others told him about seeing Jesus. 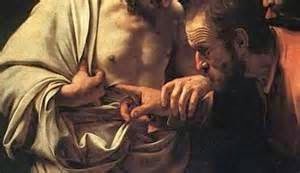 “Unless I shall see in His hands the imprint of the nails, and put my finger into the place of the nails, and put my hand into His side, I will not believe,” was all that Thomas could say. Eight days later, his disciples were inside once again, and once again behind shut doors. And again, as before, Jesus suddenly stood in their midst and gave them a greeting of peace. Much later, after Jesus had ascended into heaven, another man had an encounter with the risen Christ. This man was Saul, the persecutor of the Christians. After his encounter with the Lord, his name would be changed to Paul. In telling about his experience, Paul summarizes the appearances of the risen Christ. “He appeared to Cephas [Peter], then to the twelve. After that He appeared to more than five hundred brethren at one time…then He appeared to James, then to all of the apostles. Last of all, as it were to one untimely born, He appeared to me also” (1 Corinthians 15:5-8). His appearance to Paul was when Paul (at that time Saul) was still persecuting the church. Saul was approaching the town of Damascus, when he was struck to the ground by a bright light, also temporarily blinding him. “Who are you,” Saul asked. “I am Jesus, who you are persecuting. Enter the city and it shall be told you what you must do” (Acts 9:3-6). It was this event of seeing Jesus that led Paul to finally believe, even though he was first adamantly opposed to it. These are all reports of those who had encounters with the risen and living Christ. These people all had to be convinced that Jesus had risen from the dead. It was their encounters with Jesus that made them believe. After Jesus had risen from the dead, he remained on earth, walking around, making appearances, eating and talking with many people and convincing everyone that he was indeed alive. He did this for forty days. At the end of this relatively short period, Jesus brought many of his disciples together in one place, and as they looked on, he began to ascend into the skies. As Jesus rose in the air, a cloud engulfed him and he was hidden from their sight. Since that time, no person living on earth has seen Jesus as did the women and the disciples in those early days. We have not seen him in flesh. Yet many of us believe that he is alive. I do. I have placed all of my trust and all of my purpose for living in this one fact. “My Lord and my God,” said Thomas when he realized that it truly was Jesus. It was then that Jesus said something that I find very interesting. “Because you have seen Me, have you believed? Blessed are they who did not see, and yet believed. All who believe in Jesus Christ do so because, in some way, they have had an encounter with him. It may not be so easily defined as it was for the believers in the forty days after Christ rose from the dead and was still on earth. I have never met anyone who has come to believe because they were temporarily blinded by a bright light from heaven. Nor have these been my experiences. But even if we have not seen, we have had encounters with Jesus, even though we do not often put it in that way. But that actually is what it is. 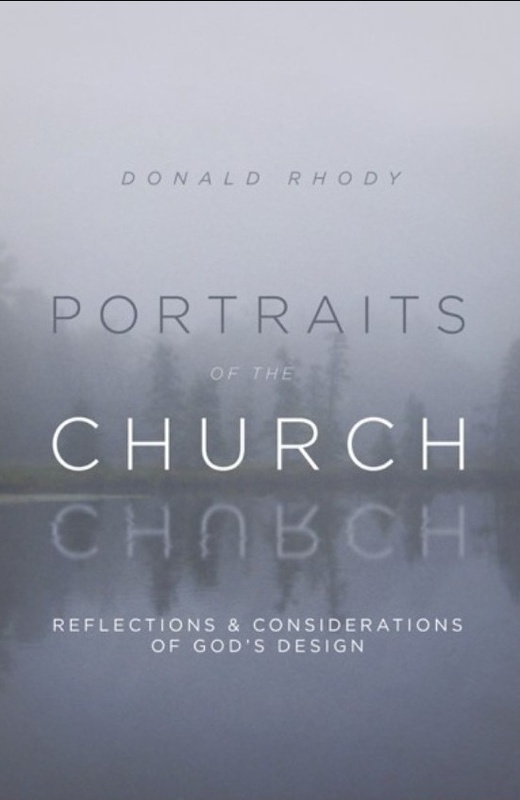 When we sense a deep feeling or a realization in our innermost being that we need to reconcile ourselves with God, it is the Holy Spirit that is prompting us to do so. Sometimes this is a highly emotionally charged event, but I think that more often it is not. Most often, I believe it is rather a gradual coming to realize that Christ is alive, just as it was for the women and the first disciples after Jesus rose from the dead. They did not immediately believe, but had to be convinced in the minds, as well as their hearts. With me, it took a number of encounters with Christ to be convinced that he is alive. It was a realization that grew with my experiences in life. The important thing is that we do not ignore the encounters that we have. If we sense God is speaking to us in some way, we need to answer. Do we have doubts? Then express them. Thomas did. Even the other disciples did. They said the testimony of the women coming back from the tomb sounded like nonsense. If we have doubts but are sincerely seeking answers, Christ will respond. This was the experience of the disciples and it has also been my experience. The important thing is that as Jesus responds to our doubts, we must also respond. In the words of Paul, “For God who said, ‘Light shall shine out of darkness,’ is the One who has shone in our hearts to give the light of the knowledge of the glory of God in the face of Christ. I pray that the eyes of your heart may be enlightened” (2 Corinthians 4:6; Ephesians 1:18a NAS).